No single architect had as great an impact upon the hilltown landscape of the Northern Marche as Francesco di Giorgio Martini. For a period of almost twenty years from 1476, under the Dukedom of Federico of Montefeltro, he designed scores of fortresses and palaces around Urbino and as far south as Jesi, each bearing the stamp which marked him out as an architectural visionary. He was also a talented painter and sculptor. Francesco di Giorgio Martini (1439-1501) was one of only a few Sienese artists to become known in other parts of Italy. He worked in the courts of Naples and Milan - where he became strongly influenced by Leonardo da Vinci - before arriving at Urbino in 1476. Federico of Montefeltro, a brilliant soldier and man of great culture, had been Duke for only three years. His court had already become an important centre of culture and learning and now he wished to create a secure kingdom over which he could rule with his own brand of enlightenment. He quickly recognised Francesco di Giorgio's genius. 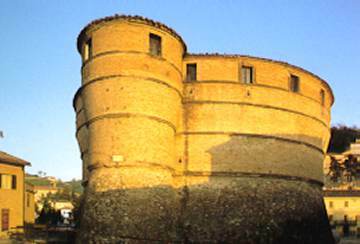 His architectural works include the fortresses of Sassocorvaro (see above - perhaps the finest of them all), Sant'Agata Feltria, Montecerignone, San Leo, Fossombrone, Cagli, Frontone and Mondavio, as well as work on the Ducal Palaces of Urbino (including the twin-turreted facade) and Urbania, the Palazzo della Signoria at Jesi and the Church of San Bernardino in Urbino.